Earlier today I posted about some excellent Zelda Merchandise that has risen on ebay since E3. 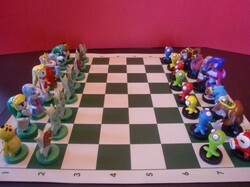 Whilst this Chess Set isn’t official, it certainly looks the part! This chess piece was posted at GoNintendo and not a lot of people posted any messages about it, and I think it deserves a little more attention! It might not look completely official, but you can’t deny that a lot of effort, skill, and not to mention love, went into creating this wonderful set dedicated to our favourite Hylian Hero. There are of course some official chess sets out there which are of higher quality, but sadly none of them Zelda (Why?! I’d buy it…) so far there’s a Mario Chess set and a Sonic the Hedgehog Chess set. Both very high quality and with a decent price tag! Not bad eh? What do you think of this chess set? Are there any characters missing that you would like to have seen included?